Inspiration is key to a songwriter. Whether it’s from a riff, an effect or the surroundings you are in, there are countless variables that can shape a song’s creation. If you are a writer who primarily uses an acoustic guitar, you may find it a nuisance to break out an amp or plug in to your laptop to be able to get the certain effect that the song needs. With the ToneWoodAmp, you don’t have to worry about that any longer. The folks at Tonewood found a way for you to be able to play with effects, unplugged. The TonewoodAmp is a compact portable effect unit with three knobs that control effects, parameters (which are programmable), volume and gain. It also features a ¼” input, an 1/8″ insert jack and an output. The insert jack can be used to access iOS apps and add your own effects. 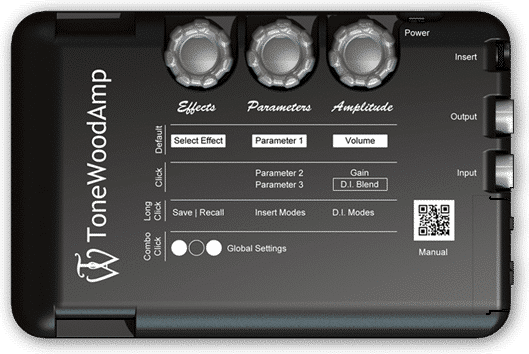 Tonewood is forward-thinking as well and have included a USB for firmware upgrades and possible future applications. According to the ToneWoodAmp website, the unit “excites” the back of the guitar in a similar fashion to how the strings excite the top, creating effects that resonate and blend with the natural tone of the guitar itself. There are a slew of incredibly useable effects onboard; reverbs, delays, tremolo, auto-wah and, yes, even distortion. I was super excited for my first jam with the ToneWood, and it lived up to all the expectations I had for it. I was able to sit either on my couch or out on my porch and play with natural sounding effects without having to worry about plugging in to an amp. All the effect’s parameters can be controlled easily with the controls on the ToneWood, so I was able to tailor the reverb trails and delay times exactly to my liking. Surprisingly, I found a big use for the distortion, as it thickens the tone and creates a nice bed for rhythm or lead work. You can also blend in the amount of effect you want to hear. This is extremely helpful in the creative process. I was able to play some cool single note lines that needed some U2-type delay and a Beatle-esque tremolo riff without having to run to my computer and record it before I forgot. And if you want to just rock your inner child out and jam with full on 100% effect noise, the TonewoodAmp can transport you back in time. ToneWood includes pretty detailed instructions to get this unit working correctly depending on what body-type your guitar has, so it is super important to follow them thoroughly. The unit sticks to the back of the guitar via a magnetic “x-brace” that is carefully placed inside the instrument. The magnet does all the support and there is no tape or anything to harm your guitar body, undoubtedly a concern for anyone. The ToneWoodAmp itself is plugged into the guitar’s output jack. That means, your guitar MUST be an acoustic-electric. ToneWood, however, partnered with Fishman and sells a sound-hole pickup off their website for your instruments that are solely acoustic. Tonewood also provides many video instructions and tips on their YouTube page and website. Between these video tips and their active user forum you’ll likely find even more inspiration to accompany the creativity the TonewoodAmp brings to an acoustic guitar.